When going for daily walks, we’ve been able to get dogs to learn the best discipline. It’s a great opportunity to teach your dog to sit and wait for traffic to clear before walking into the street, and help them learn how to behave around people and other dogs. Don’t have time to walk your dogs in your busy schedule? Not to worry! Hustlin’ Hounds exists for people like you! 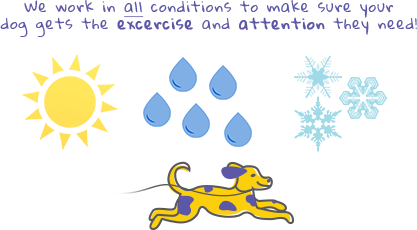 Give us a call, and we’ll set up a time to meet to discuss how we can help you get your dog the exercise he or she needs without tying up your day!